Alicante, the capital of the homonymous province of Alicante, is part of the region of Valencia, located on the south-east of Spain. 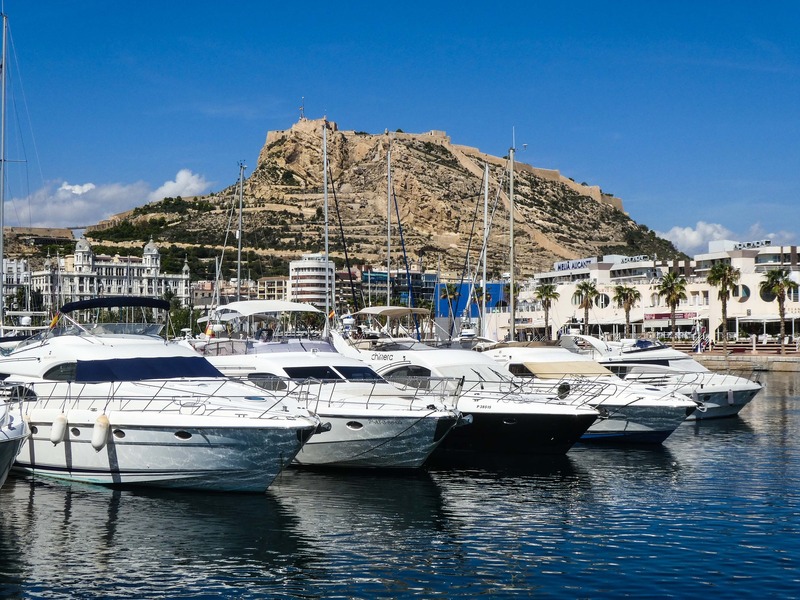 Alicante is also a quite important harbour on the Mediterranean Sea, on the Costa Blanca. With a population of approximately 350,000 inhabitants, it is one of the most flourishing cities in Spain. 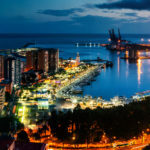 Alicante’s economy is based on the services sector, being tourism one of the most important ones, though it also exports wine, olive oil, fruit, leather, fabric and pottery. And we cannot forget to mention the world famous paella, one of Alicante’s gastronomic specialties. 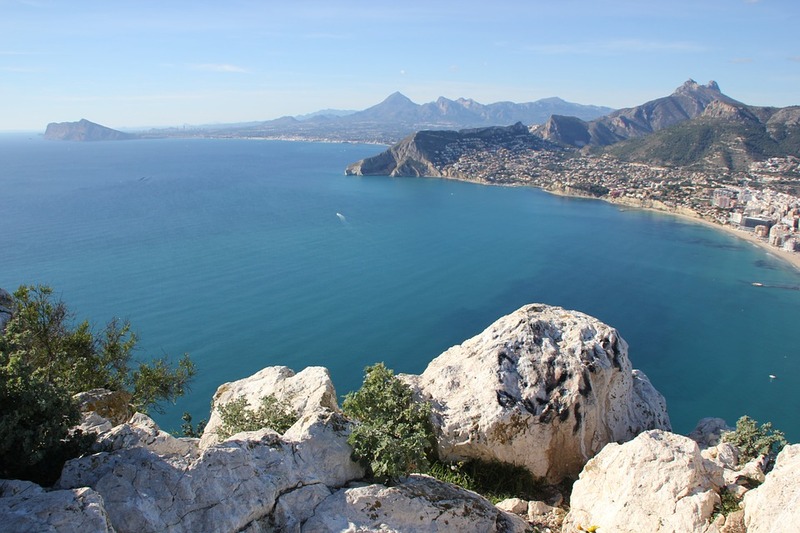 The Costa Blanca has a Mediterranean climate with mild winters, with average temperatures of 11ºC, and pleasantly warm summers, with average temperatures of 26ºC. 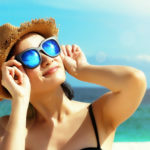 As it has many hours of sun, you can sunbathe there from May till October. Alicante is also surrounded by hills, which creates a unique microclimate with little rainfall during the whole year. The few cases of rainfall usually take place between September and October. Alicante’s airport, El Altet, is located at only 15 kilometres south of its centre. Thanks to it Alicante is easily reachable from any point in Europe. 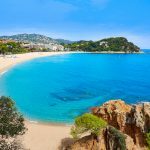 Among the facilities it offers, you will find many shuttle and taxi services covering the route from the airport till many of the beach resorts on the Costa Blanca. From Alicante’s centre, there is a subway line connecting it with some of the beaches on the Costa Blanca. There is also a tram line, which connects Alicante to the neighbouring city El Campello, where there is a connection to Benidorm. There are also regular ferry services to the Tabarco Island and to the Balearic Islands (Mallorca, Ibiza and Menorca), and even to Algiers. 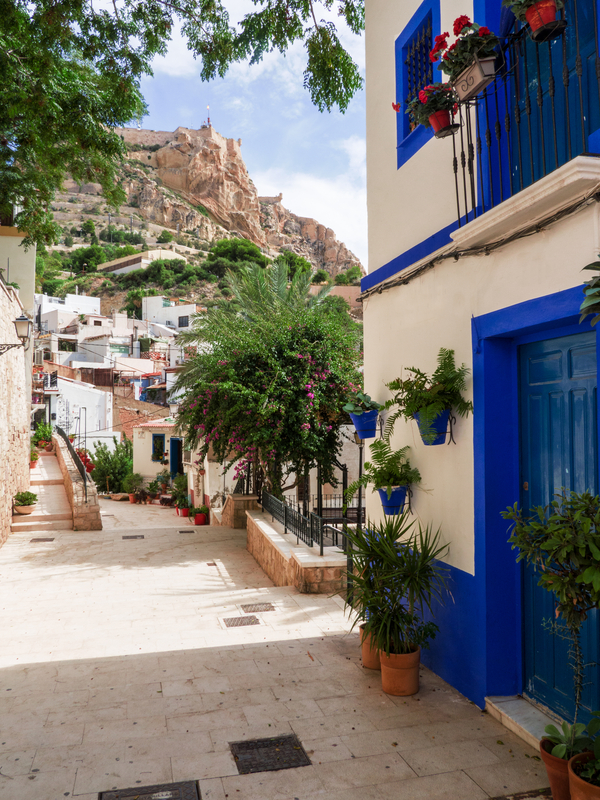 Alicante was founded in 320 BC by the Carthaginian general Hamilcar Barkas, which named the city Alkra Leuka, meaning “white mountain” in Ancient Greek. The city was given the name Lucentum after it was conquered by the Romans during the year 201 AD. In 711 AD, Alicante was besieged by the Moors, which eventually conquered the city. The local inhabitants were forced to flee to the inlands along with the Visigoth army, which was heading north, to the Pyrenees. In the end, it was the Moors who established the current name of Alicante. Alicante remained in the possession of the Moors from the 8th till the 13th century. During this period, they built a fortress on the outstanding rocky hill, so they could protect themselves from the assailants. This fortress evolved to what is nowadays known as the Castillo de Santa Barbara. After many battles between Arabs and Christians, Alicante became part of the Kingdom of Aragon, during the 13th century. In the early 18th century, during the War of the Spanish Succession, Alicante got visited by the British and, thereafter, during the Spanish War, by the French. Later on, Alicante had to bear the Italian and the Germans during the Spanish Civil War and the Pied-Noirs (the Black Foot) during the war in Algeria. It wasn’t until the 60s that Alicante started to develop remarkably and that its population increased. The small old town, located between the Rambla at the town’s old walls and the hill of the Castle of Santa Barbara, is where you will find the main monuments. 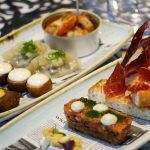 At the old quarter of Santa Cruz, with its picturesque alleys and stairs, surrounded by white houses decorated with flowers and colourful tiles, you will find the delightful hermitage of Santa Cruz. 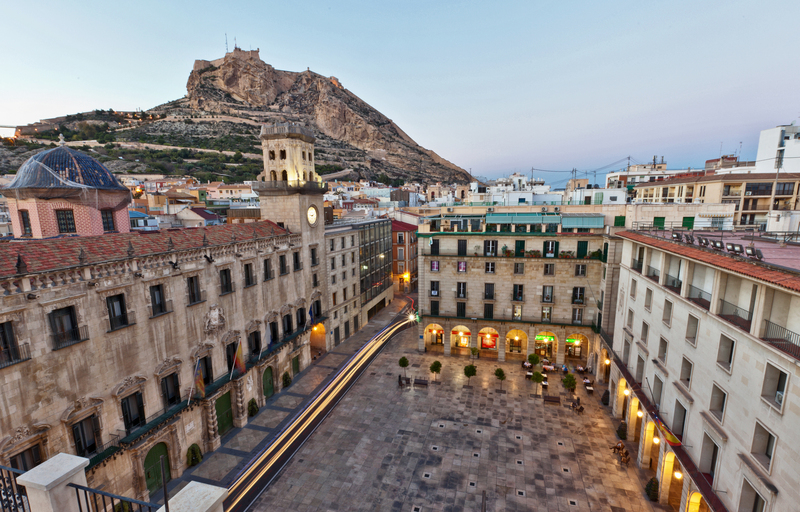 At Alicante’s old town, you will also find many different beautiful and well-preserved churches such as the recently restored Iglesia de San Roque, the squared Baroque Cathedral of San Nicolas de Bari, and the Gothic Iglesia de Santa Maria, built on the foundations of a Moorish mosque, which is still visible through the glass bottom floor. The beautiful Baroque town hall draws attention because of its two towers, its charming entrance, and its dome. The 18th century monastery of the nuns of the Purísima Sangre de Cristo is completely fenced, but its church is open to the public. The Palacio Maisonnave, at the calle Labradores, is a former mansion from the 18th century, where nowadays you can find the provincial registry. The Castillo de Santa Barbara is a complex of buildings and defence walls dating back to different periods, from the 9th century, when the Mores inhabited in Alicante, till the 18th century. It is built on the Monte Benacantil hill, which is the highest point of the city. You will also find there rests of the Bronze Age, and the Roman period. This castle is the biggest castle complex on the Costa Blanca and on the whole Mediterranean area. It is surrounded by many beautiful parks and gardens, terraces and kiosks, and many expositions are held there. The Castillo de San Fernando was built to protect Alicante against the invasion of Napoleon’s troops. Built on a lower hill than the previous castle, this one was never completed and looks a bit abandoned nowadays. The quarters of el centro, Sant Anton and el mercado are characterized by their splendid boulevards, which makes them a very enjoyable place to have a walk. The Plaza de Los Luceros quarter attracts attention because of its beautiful fountain with sculptures of horses and mythological figures. The Provincial Palace, with its Neoclassical and Baroque style, on the Avenida Estación, housed from 1932 till the year 2000 the Archaeological Museum, which later moved to the MARQ (Archaeological Museum of Alicante). Alicante’s market complex, the Mercado Central, dates back from 1912 and contains two floors, built on the exact site of the former walls of the city. On Alicante’s coast line, there are plenty of boulevards with palm trees and with amazing sights on the marina. It is the perfect place to have a walk. In the arena of the Plaza de Toros, built in 1888, you will find the museum and the academy of bull-fighting, along with some sculptures made of bronze. The Museum of Fine Arts, founded on the 18th century at the Gravina Palace, opened its doors on 2001, and has an overview of 500 years of art, from the 16th till the 20th century. The Museum of Modern Art was founded during the 17th century in la Asegurada, a building of Valencian-Baroque style. This building used to be Alicante’s town hall, but it was also used as a prison and a barn. Nowadays, it houses modern art from the 20th century, with artists like Pablo Picasso, Juan Gris and Joan Miró. The small Museum of Cribs, in Alicante’s old town, shows the Spanish tradition of making cribs for Christmas. The Provincial Archaeological Museum of Alicante (MARQ) is placed in a large building that dates back from 1924, and contains many different rooms with elements from the prehistoric, Iberian, Roman, Medieval-Moorish, and Christian culture. You will find rural, urban and underwater archaeology in its huge collection. Because of its modern expositions, in 2004, the MARQ was chosen as the European Museum of the year. In the university campus, at the northwest of Alicante, there is the University Museum, which opened in 1999 and is mainly focused on contemporary art and the conservation of it. Alicante’s Ciudad de la Luz centre is the most complete and modern audiovisual complex in Europe. It is located at 7 kilometres from the city centre and offers all kinds of facilities for the film, TV and publicity industry. It contains 10 movie sets, a specific zone to record water scenes, and a school to learn audiovisual techniques. The Spanish Esplanade is a beautiful boulevard with palm trees, which runs through Alicante’s coast line, covered with 6,600,000 mosaic tiles with a pattern of three colours. You will find many different bars and restaurants on this boulevard, and also an open air auditorium. At the large Spanish Esplanade, you will find the Parc de Canalejas, with its impressive centenarian ficus that can reach the 20 metres high. The Parc de L’Erata, on the slope to the Benacantil hill, has many gardens and invites you to have a small walk around the Castle of Santa Barbara. On the small Esplanada de Ramiro, at the Postiquet beach, you will find the rests of the old town walls. 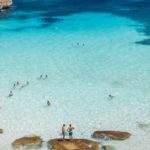 And, of course, Alicante also has beautiful beaches where the sun lovers can lay and relax: – Cala la Salinas is a peaceful and rocky beach that is very popular among the amateur fishermen and that offer, from a distance, amazing views of houses. The sea in this area is known to have middle-high waves. Cala los Borrachos, with its middle-high waves, is also very popular beach among amateur fishermen. El Postiguet is a large beach, with still waters, which make it extremely suitable for all kind of water sports. Tourists will find here the main facilities for a pleasurable beach holiday. San Juan is a wide beach with average waves and golden sand. This beach offers many facilities such as: showers, beach volleyball tracks, paddle boats to rent, beach kiosks, playgrounds for kids and many different bars and restaurants along the boulevard. 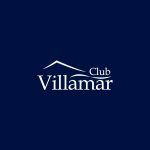 Choose now out of the great range of holiday homes in Alicante with Club Villamar.